Howdy! I have a new Japan Times article...but since it's about bentos, I wrote about it in more detail over on JustBento. But if you have any comments or questions or so you can leave them here...since the comments on that site are not working yet. ^_^; And here is the direct link to the Japan Times article. Enjoy! Submitted by maki on 2014-03-19 17:46. What a coincidence - I made a bento for lunch today - first time in ages. Rice, meatballs cooked in glaze, carrot onion & celery kinpira, zucchini pickle and my favorite one-egg tamagoyaki, plus a tangerine for dessert. Tomorrow the leftover rice will be fried with a little ham & egg. 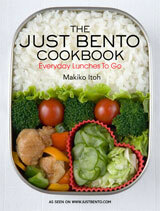 Glad to see an article on Just Bento again - hope you are well. Excellent article, and a timely reminder for me that I don't have to make my bentos complicated to make them attractive. Still learning! I'm very glad to see you're planning on reviving the justbento page as well, as your page was part of what first drew me into the wonderful world of bento in the first place! I've been making bentos for myself for about a year now. I was initially driven to it by a management change in my employer's cafeteria which initiated a decline in the food quality. (We're in an extremely rural area and there are NO restaurants of any kind within a reasonable drive for lunch.) But I will probably always pack my own lunch unless I were to move to a place that had healthy restaurant options. The dinner leftovers that used to rot in the fridge get eaten now. The subtle daily anxiety over whether I could find something healthy to eat at the cafeteria is gone. It takes me very little additional time and effort to pack my bento during the dinner clean-up, usually about 5 - 10 min.. And it's you, Maki, who inspired this major improvement in my life. I don't think I've ever thanked you for it, so THANK YOU! I'm sure you've made a similar difference in a lot of people's lives. This isn't really about the current article, but about something I saw the last time I got a newsletter; it was about cutting your cooked rice into cubes, for easier eating. Anyway I thought , why not just start with cubes? I made some sushi rice according to directions, then packed it into an ice cube tray that I had sprayed with non-stick spray. Then I wrapped it in plastic wrap and froze it. Once the rice was frozen, I popped it out and put my "rice cubes" in a zip-lock bag. This has worked out well for me, as I can put a few in my lunch: I don't need to thaw then, they are usually thawed out by the time I have lunch. Great article AND site. I first read about you a few years ago on someone else's web site, but somehow forgot about you. Ooops! :-) I am not Asian, but my best friend is, and she's enlightened me more to bentos and Asian cooking, etc. I just got your FABULOUS book from the library and plan to buy it as well. THANKS for your articles here, and for JustBento.com as well. For a beginner like me, and for someone who's not Asian, I really appreciate your work. I can't wait to bento ALL the time now! Keep the awesome articles -- like this one!! -- coming. Best of health and happiness to you. Welcome back maki!! more good health to come for you! Am a filipino chinese here in the UAE, where I have to cook for myself if I want to eat well. Ur site is wonderful and I have taken so many ideas from you!! Thank u so much for your work! Blessing!!! I'm making bentos once aeweek for the entire family, but starting next fall, I'll have to do them every day. I bought only one-tier bento boxes to simplify the task in the morning, but still I need more than an hour to get everything ready. Choping is a long task, cooking is longer when you have more, and I need space on my counter to help the food cool down before I pack it. I'd love to see some testimonies about multiple-bento preparation. Using leftover is not an option, unless you really cook twice what's needed in the evening! Good to know you're still with us! I bought the cookboooks some time ago and use it constantly. What a good resource you gave us! Here's wishing you very, very well and sending hugs. great to see an article again! Glad to see you back and the bentos look yummy! I usually do mine to bring to my office. I bought nice japanese bentos and some coworkers started doing the same. It's a good way to eat healthy homemade food. I like your food blog.I'am fond of Japanese food. 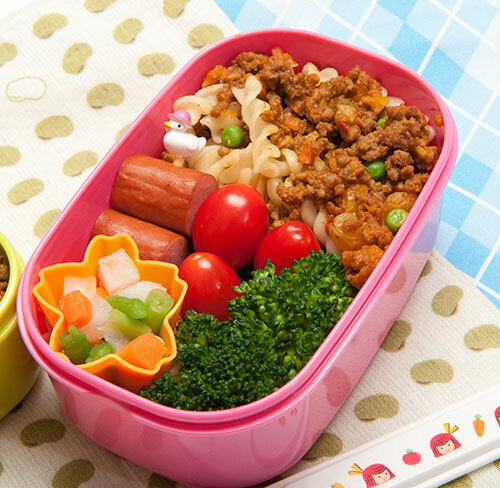 Those bento boxes make school lunch look so delightful! Great article! My apologies, Makiko - in my previous comment, I wrote your name completely incorrectly. Perhaps I was so excited to post here, my fingers got carried away. :-) Thanks for both of your web sites and your book. I look forward to your work, whenever you're able to create more. Thanks!! Jesus, Maki, I hope you're fully recovered soon. As a westerner who's spent about 6 months in Japan, your blogs have played a huge role in helping me learn to make the delicious food I had while over there. I'm enormously in your debt, and wish nothing but the best for you.